Sometimes, in the history of technology, some ideas touch the envelope of the future, but do not quite make the jump to sustainability and fade away. However the idea perseveres and eventually is picked up by other companies and managed to success. Such is the history of the Neophone company. They were the first company to issue vertical cut disks played with a semi-permanent stylus – a technology picked up by the Pathe company of France, and were the first company to produce a long playing record. These technologies were implemented in around 1904, and the vertical recording was soon emulated by Pathe in 1906 and several other small French record companies. The long playing idea took around 20 years to resurface again. The Neophone company itself was a short lived British company. The inventor of the Neophone "indestructible" record was a German, Dr. Michaelis. The records themselves were a white plastic type composition material on a compressed cardboard type backing. Some writers have claimed this backing was compressed straw. On close inspection it resembles more thick cardboard – but may contain straw! The records were claimed to be "indestructible". Judging from their scarcity this is questionable. The main issue that affected the company was a lack of capital added to the fact that this was a small company with limited output of a format that required specialist equipment. Limited capital also meant that one could not pay the top performers. The paying public wanted to buy records of the top performers. Juxtaposed to this was the Berliner company (Victor, HMV) that produced laterally cut records and was signing up all the major stars – from Caruso, Melba, Patti etc, and with economies of scale, and a global enterprise, could press hundreds of thousands of records and make a good profit. To prove the Neophones indestructibility, Dr. Michaelis would assemble potential customers at the top of a four-story building, and throw a record (Neophones are quite light) out of the open window to the street below. An office-boy then dashed down the stairs and retrieved the record. This was then played, as clear evidence that it was none the worse for its rough treatment. However, customers did not buy records to drop on the heads of unsuspecting pedestrians. The records did not sell well – indestructibility may have been proved height-wise, but if left for a while in the sun, they deformed badly and curled up. They also had a lot of surface noise! Thus it happened that many hundreds of recordings of military bands, banjo soloists, concertina players, and singers, both comic and serious, were made, but never heard. 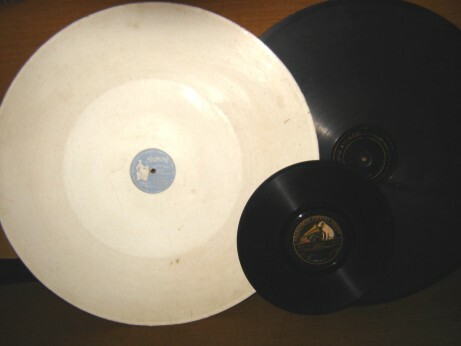 The first series that included the 20 inch long playing record had labels that were white on wedgewood blue and had no title or artist details. This was scratched onto the record surface between the last recorded groove and the label. The second series were issued on a black material called Neolite (was similar to the standard shellac). By 1907 Neophone was bankrupt and was merged into the General Phonograph Co. The “20 inch” disk (it is slightly larger) is pictured here together with a Pathe 20 inch disk. The Pathe played for the same time as a 10 or 12 inch disk, only with bigger grooving that allowed for a louder sound.